The Walking Dead #152 Review 0 out of 5 based on 0 ratings. 0 user reviews. As low-key as it was at times, The Walking Dead #150 has injected the series with a greater sense of momentum. Now Rick Grimes faces enemies from within and without as he prepares his people for war and faces continued opposition from those unhappy with his decisions. This issue continues building an exciting new status quo, though one element of the book is a bit troubling. Issue #152 pushes the series forward on multiple fronts. Robert Kirkman builds on the previous chapter’s revelation that Eugene has made radio contact with another mysterious survivor. That leads to a tense conversation as the two characters try to feel each other out and determine if they’ve stumbled across a new ally or an unwanted enemy. This subplot gives the book a nicely unpredictable quality as the status quo continue to build towards another war between rival settlements. The rest of this issue is devoted to exploring life in Alexandria as Dwight builds his militia and Rick reasserts his authority. There’s a clear sense that the peaceful aftermath of “All Out War” is now irrevocably shattered. There’s also a general sense of unease to these scenes as Kirkman explores the question of whether Rick, by embracing Negan’s leadership methods, is in danger of becoming too much like Negan. This is the one area where this issue stumbles. It’s as if a switch has suddenly been flipped and Rick has suddenly morphed into a paranoid bully. There’s a huge amount of potential in exploring the idea that the series’ main protagonist has lived long enough to see him become the villain, but Rick’s transition needs to be handled with more grace and subtlety than it is here. Charlie Adlard renders this issue with his usual flair. 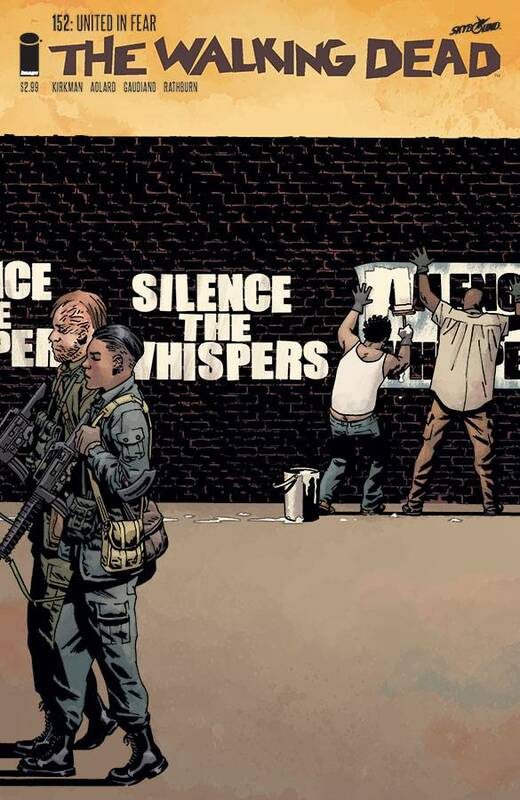 Adlard is able to highlight the tension of Eugene’s radio conversation, turning what is essentially several pages of a man talking into a microphone into something darker and more dramatic. This issue gives Adlard several other moments to shine, whether it’s drawing a herd of decaying zombies, a brutal physical showdown or the shadowy labyrinth that is Negan’s prison home. The Walking Dead continues its shift into a compelling and uncertain future with this newest issue. It’s clear that, after a period of relative peace and quiet, dark days again lie ahead for our heroes. Rick’s new status quo might just be the most intriguing of all. However, the series will need to explore his questionable actions and general state of mind with more subtlety in the future.